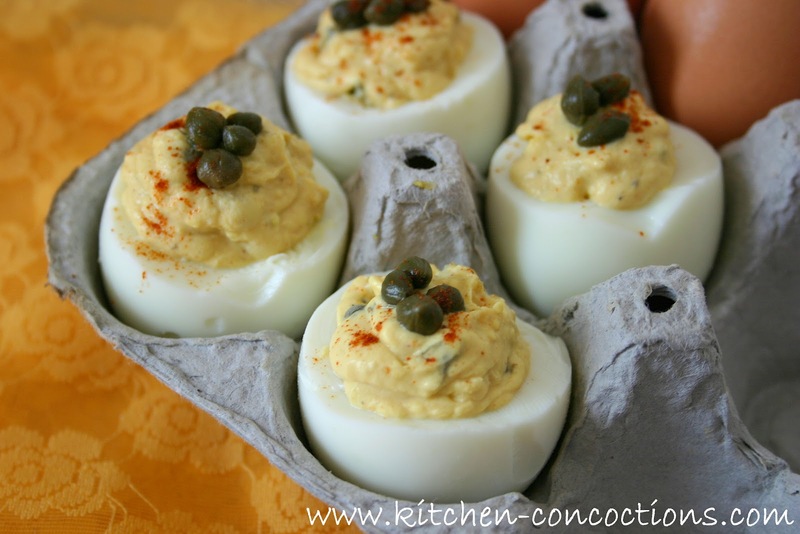 I couldn’t give you a recipe for naturally decorated hard boiled eggs and not give you a recipe for deviled eggs! Even though deviled eggs remind me of Tupperware parties from 1950-something and seem like they should ONLY be eaten at Easter because after dying, well, like 4 dozen eggs, what else are you supposed to do? Well folks, even though deviled eggs DO remind me of poodle skirts and bobby socks and brightly colored Easter eggs, I am here to tell you that deviled eggs are making a come back! Deviled eggs can be dressed up with so many flavor combinations and pretty plate presentations. 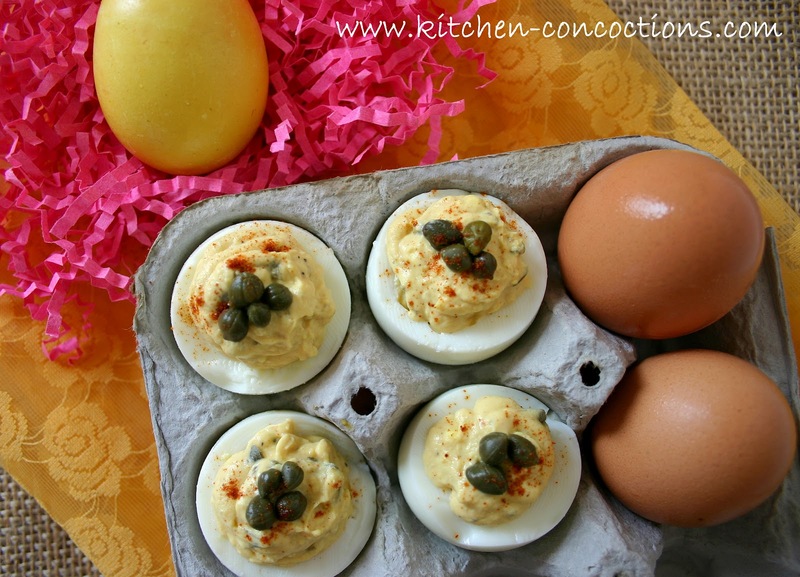 Like, take the recipe today… with lemon juice, capers, and Dijon mustard; these ain’t yo’ Mama’s deviled eggs! Place eggs in a pot, cover with water and bring to a full boil. Turn off heat, cover pot and let stand for 12 minutes. Drain water and run eggs under cold water. Crack and peel eggs. Slice eggs in half and remove yolks. Place egg yolks in bowl. Add grated onion, garlic, minced capers, lemon juice, mustard, hot sauce, salt, pepper, paprika, and mayonnaise. Mash all ingredients until smooth, adding a bit more mayo if too dry. Cut a corner off a plastic bag and fill with the mashed yolk filling. 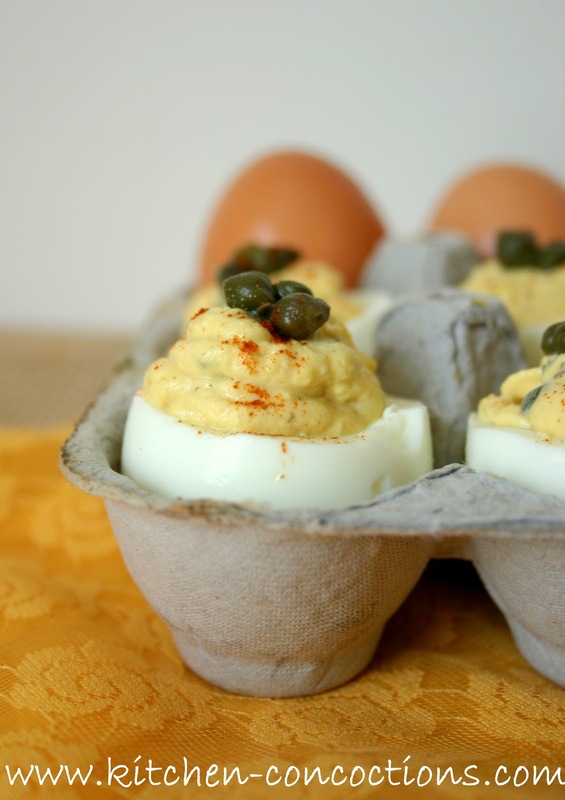 Pipe into egg whites and garnish with a 2-3 capers and a dash of paprika. These look so good and I love your presentation too!